The new Sonicator Plus 920 is a two-channel combination unit both a membrane panel and a touch-sensitive screen to allow clinicians to quickly set up treatments. 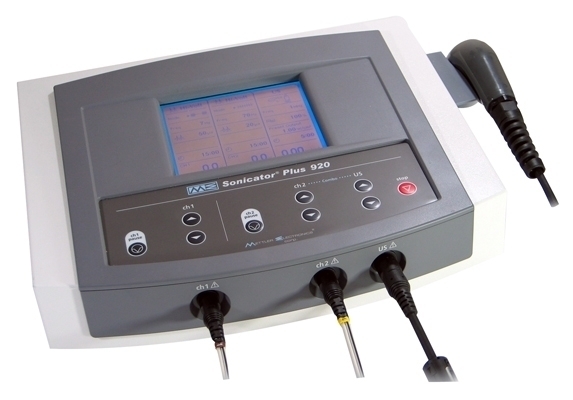 The Sonicator Plus 920 offers 1 and 3 MHz ultrasound using a dual frequency 5.5 cmÂ² applicator. An optional 0.9 cmÂ² applicator at 1 and 3 MHz is also available. Clinicians can use up to two different waveforms using two channels simultaneously with several different amplitude modulation options such as the surge, reciprocation and vector sweep. Dimensions: 13.6" x 4.9" x 10.5"